(From left) Maine TRC’s Esther Attean Altvater, Penobscot Indian Nation Chief Kirk Francis and Dr. Gail Werrbach meet with media at the Announcing of the Commissioners, Dec. 18. Dr. Werrbach is one of five Commissioners being sworn in tomorrow in Hermon. Photo by Arla Patch. The Maine Wabanaki-State Child Welfare Truth & Reconciliation Commission (TRC) calls upon all people to help the group prepare for its difficult work by participating in a Day of Reflection, Meditation and Prayer today, Feb. 11. A key moment in the Day of Reflection, Meditation and Prayer will be at 11 a.m. when all are asked to pause to consider the importance of the TRC and how everyone can support its three-fold purpose of uncovering the truth, promoting healing and making recommendations for best child welfare practices. Tomorrow, Feb. 12, the five TRC Commissioners, Matthew Dunlap, gkisedtanamoogk, Dr. Gail Werrbach, Sandra White Hawk and Carol Wishcamper, will be officially sworn in during the Seating of the Commission, a day-long event held at the Morgan Hill Event Center, Hermon, starting at 10 a.m. The Seating of the Commission event will include remarks from the six governmental signatories, lunch, learning sessions, a Commission listening session and closing Tobacco Ceremony and song. The public is invited to attend the event. 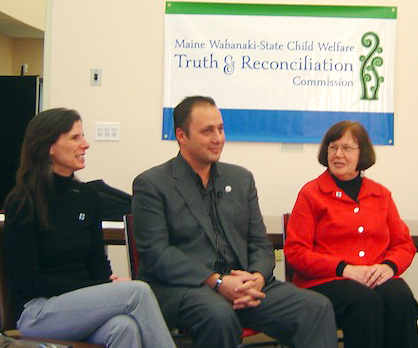 The TRC represents a historic agreement between Wabanaki Tribal Governments and the State of Maine to uncover and acknowledge the truth about what happened to Wabanaki children and families involved with the Maine Child Welfare system; to create opportunities to heal and learn from the truth; and to collaborate to operate the best child welfare system possible for Wabanaki children. The Maine TRC process represents the first truth and reconciliation effort within U.S. territory that has been collaboratively developed between Indian nations and a state government. Last June, all five Wabanaki Tribal Government Chiefs and Governor Paul LePage signed a Mandate document specifying how the TRC should be conducted. If you wish to attend the TRC Seating of the Commission, please register with Esther Altvater Attean at eattean@usm.maine.edu or call (207) 615-3189.